Strong thunderstorms erupted on the evening of 04/28/17 and continued into the overnight, expanding in coverage and producing prolific lightning in spots. The Weather Prediction Center’s Metwatch Desk was particularly busy issuing multiple Mesoscale Precipitation Discussions (MPD) to stay ahead of the flash flood threat. As Greg mentioned, GOES-16 6.9 μm “mid-level” water vapor imagery shows a relatively flat shortwave aiding in the maintenance of the Mesoscale Convective System (MCS) over Indiana and Ohio, while a stronger shortwave can be seen moving out of Iowa into southeastern Minnesota. What other features can you identify in this animation? The GOES-16 1-minute 0.64 μm “Red” visible animation shows the incredible detail in the cloud top environment (0.5 km resolution) of the aforementioned MCS moving through Indiana and Ohio. Note the persistent overshooting tops and their subsequent gravity waves rippling across the cirrus shield. This is indicative of healthy, organized updrafts which a forecaster can then make a decision on whether the activity will persist, strength, or weaken with time. Once again, the 1-minute imagery proves valuable here as the trend of the cold cloud tops can be seen expanding with the MCS, while new convection fires near the Illinois, Kentucky, and Indiana borders. Note the dark pixels indicating very cold overshooting tops. Can you spot the enhanced-V structures down-stream from those towers? The ongoing MCS in the above GOES-16 10.3 μm “Clean” infrared animation with GLD-360 5-minute lightning density overlaid appears to weaken a bit as new convection farther southwest takes advantage of a stout low-level jet. Notice how the lightning cores are exceeding the color scale that was set by the developers at OPC and NESDIS. Grant it, the color scales are somewhat limited by the GEMPAK software (6.5 bit or 96 colors), yet it’s safe to assume the lightning activity is very intense. As Andrew referenced in his MPD, as the night progressed, the convection along the Midwest through Ohio Valley erupted into an elongated MCS with embedded Mesoscale Convective Vortices (MCVs) that will have to be watched later in the day. As you can see in the above Quantitative Precipitation Forecasts for Day 1 (top) and Days 1-3 (bottom), this was only the beginning of a prolonged flood threat for the Mid-Mississippi Valley and eventually farther north to western Michigan. GOES-16 is certainly proving to be useful in operations as the increased temporal and spatial resolutions when compared to GOES-E (13) and GOES-W (15), provides more detail, fluidity, and trend monitoring to assist in the forecast decision-making process. Additional channels, multispectral imagery (RGBs), band-differences, and derived products will be explored throughout 2017, so please stay tuned for more posts! A significant severe weather event impacted E TX, LA, and MS on Sunday, April 2. A SPC Moderate Risk for severe had a region upgraded to High at the 1630 UTC Day 1 outlook for the tornado threat. Given the threat, GOES-East RSO was requested by SRH, and Mesoscale Domain Sector 1 granted over the region. The early day setup included a closed upper low moving NE across central Texas towards Arkansas. At the surface, an MCS and associated cold pool from the previous evening was traversing eastward through Texas. Ahead of this feature, strong southerly flow drew up warm, moist Gulf air. The evolution of the overnight MCS is depicted in 5-min GOES-16 ABI 10.4 um clean window IR imagery below. This channel is the “cleanest” of the IR channels because it is least sensitive to absorption by atmospheric constituents such as water vapor. The development of thunderstorms during the evening of the 1st is seen as rapid cooling of the cloud tops in SW Texas. The rapid expansion of the cold cloud tops signals the continued maintenance of convection, and development of an MCS. By early morning on the 2nd, rapid warming becomes evident, especially on the southern end of the MCS, signaling a weakening and dissipation of thunderstorm activity. The higher spatial (2km vs 4 km) and temporal (5-min vs 15-min over CONUS) resolution of the GOES-16 satellite allows for these cloud top temperature trends to be more easily and promptly diagnosed. By late morning, convection began to develop within the warm sector in E Texas and Louisiana ahead of the previous evening’s weakening cluster of thunderstorms. These storms quickly became severe, producing large hail, wind and tornadoes. Detection of convective initiation is significantly improved in the 1-min, 0.5 km visible imagery, as was shown in a previous blog post that compared GOES-16 data with GOES-13 data for initial storm development. Storm top features of mature convection are also easier to discern in the GOES-16 imagery compared to current GOES satellites. Below is a side-by-side comparison of 0.5 km, 1-min VIS from GOES-16 and 1 km, Rapid Scan (5-15 min) VIS from GOES-13. Additionally, GOES-16 2 km, 1-min IR is compared with GOES-13 4 km, Rapid Scan IR. The time period is 2145 UTC to 2315 UTC. Storm top features apparent that are associated with strong-severe weather at the surface include overshooting tops, enhanced-V’s, and above-anvil cirrus plumes. Gravity waves emanating from the updrafts, indicators of turbulence and caused by strong updrafts, are also more obvious in the GOES-16 data. The Geostationary Lightning Mapper (GLM) is the other new earth-pointing instrument aboard the GOES-R series of satellites, and can detect total lightning activity with uniform detection efficiency. Data from the GLM are not yet available, however ground-based networks can be used to get a feel for how GLM data will generally look in AWIPS. Plotted is GOES-16 2-min visible imagery with Earth Networks 1-min Total Lightning Pulse density data, binned in 8-km grid boxes to match the resolution of the GLM, overlaid as semi-transparent. Pulses are a very basic variable, and when binned into grid boxes over a time period, provide a good measure of fluctuations in lightning activity. Max’s in total lightning density activity signify the core updraft regions of thunderstorms, which are also represented in visible imagery by a high degree of texture and overshooting tops. Rapid increases in lightning density signify rapid upticks in updraft strength, and thunderstorm intensification. Similarly, decreasing trends in total lightning activity will signify a weakening storm. By early evening, the strong/severe storms had organized into a linear system, and while the severe threat had lessened, a flash flood threat had begun. A separate post will be written with details about the flood event. 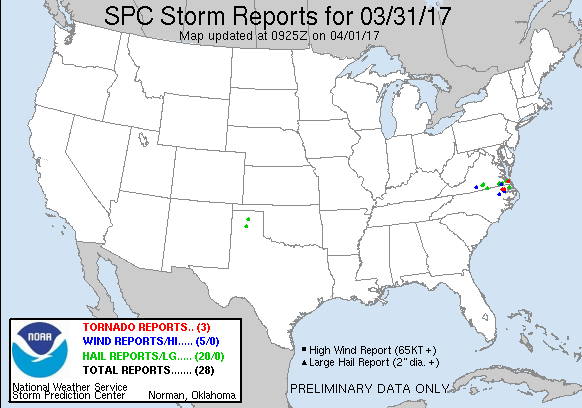 On the afternoon of 03/31/17, severe thunderstorms, including a couple long-lived supercells, moved across the southeastern most part of Virginia leaving behind a path of hail, wind damage, and at least one tornado, with two more reported in northeast North Carolina. These storms developed in association with a mid-level trough and related surface cyclone and cold front. GOES-16 10.3 um “Clean” infrared animation valid on 03/31/17. Made using GEMPAK. *Preliminary, Non-Operaitonal Data* Click here to open in a new window. The 10.3 µm “Clean” infrared channel on GOES-16 shows the large storm system transitioning to the East Coast with a dry slot that moves into eastern NC/VA quickly erupting into thunderstorms. Note how the cloud tops associated with the secondary band that develops in the afternoon quickly cool, then appear to jump to the Gulf Stream. This becomes a forecast challenge for the local National Weather Service offices as the storms transition from the land, to nearshore water, then to OPC’s offshore zones. GOES-16 6.9 um mid-level water vapor animation valid on 03/31/17. Made using GEMPAK. *Preliminary, Non-Operational Data* Click here to open in a new window. GOES-16 7.3 um low-level water vapor animation valid on 03/31/17. Made using GEMPAK. *Preliminary, Non-Operational Data* Click here to open in a new window. The 6.9 µm and 7.3 µm water vapor channels show the enhanced warming (drying) in the mid to low levels where the atmosphere becomes unstable in the presence of near-surface warming/moistening and strong forcing with the upper-low coming in from the west. The supercell ahead of the main forcing remains isolated until later in its lifecycle with the dry slot aiding in the instability. GOES-16 7.3 um low-level water vapor valid on 3/31/17. Made using McIDAS V. Click here to open in a new window. Zooming in on the area of thunderstorm development in the 7.3 µm low-level water vapor channel (~700 mb), the region of enhanced mid/low-level drying/warming ahead of the cold front within which isolated thunderstorms developed is apparent. Behind the cold front, that region of the atmosphere is expectedly cooler. The 7.3 µm channel is new with the GOES-R series, and when combined with the higher spatial and temporal resolution, allows forecasters to track (for the first time) low/mid-level features such as elevated mixed layers and cold fronts aloft. 00z 01 April 2017 Weighting Function at Moorhead City, NC. Click here to open in a new window. 00Z Weighting functions (UW/CIMSS) from the GOES Sounder 7.4 µm channel (very similar to ABI 7.3 µm) at MHX (just south of strongest t-storms) confirms that the drying/warming we are seeing is centered around 700 mb. 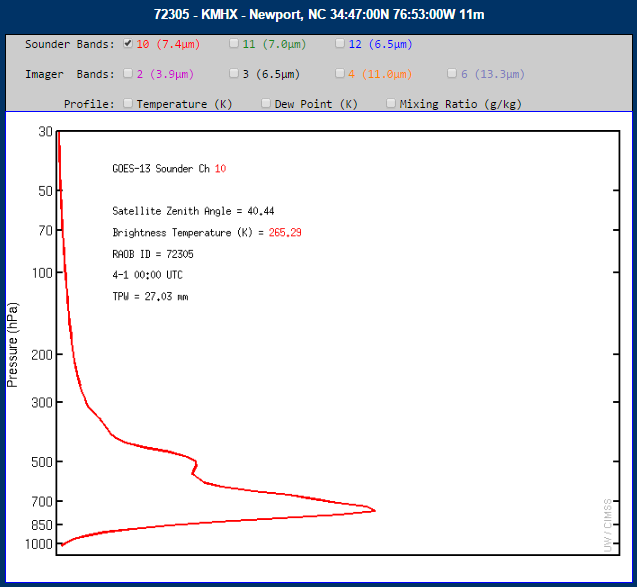 Radiosonde profiles at Morehead City, NC (left, ahead of cold front) and Roanoke, VA (right, behind cold front). Click here to open in a new window. 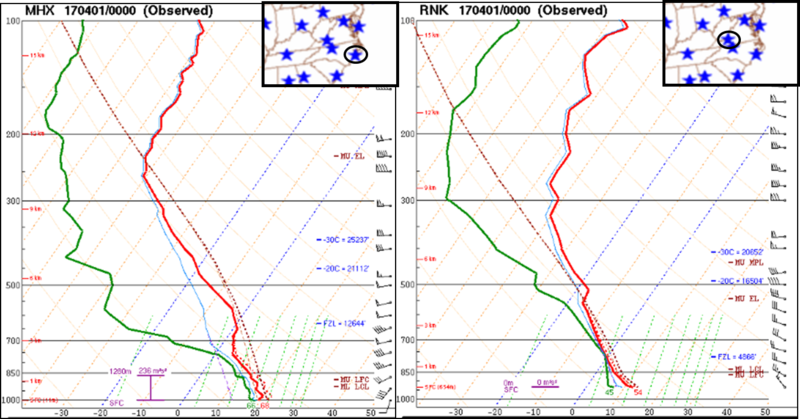 Looking at 00z soundings for comparison, mid-level drying was indeed present above near surface warming/moistening ahead of the cold front in Morhead City, NC leading to an unstable atmosphere. Meanwhile behind the cold front at Roanoke, VA, the cooler surface and moistening aloft led to a significantly less unstable environment. GOES-16 10.3 um “Clean” infrared with the GLD-360 15 minute Lightning Density product overlaid, valid 0000 UTC 03/31/17 – 0645 UTC 04/01/17. Made using GEMPAK. *Preliminary, Non-Operational Data* Click here to open in a new window. The 10.3 µm “Clean window” infrared channel overlaid with the 15-minute GLD-360 lightning density product produced at OPC, shows the rapid increase in lightning activity as the storms in the dry slot mature. This lightning density has proven quite useful to forecasters as a proxy to the Geostationary Lightning Mapper (GLM) that is located on GOES-16. The OPC forecasters can then use this information to characterize the thunderstorms as they move offshore into active shipping and fishing areas. Storm Prediction Center Storm Reports for 03/31/17. Click here to open in a new window. AKQ Base Reflectivity valid from 1800 UTC to 2358 UTC on 03/31/17. Click here to open in a new window. AKQ Base Velocity valid from 1800 UTC to 2358 UTC on 03/31/17. Click here to open in a new window. GOES-16 0.64 um “Red” visible animation (500 m) valid on 03/31/17. Made using McIDAS V. Click here to open in a new window. These storms developed within mesoscale domain sector (MDS) 1. This meant that 1-min imagery was available for this event even though no domain was requested, and because a domain was not requested elsewhere. The 1-minute, 0.5 km 0.64 µm “Red” visible imagery shows isolated supercell thunderstorms developing out ahead of the cold front in a warm, moist atmosphere. Additional development is noted along the cold front, which raced towards and caught up to the isolated thunderstorms by sun down. GOES-16 0.64 um “Red” visible, 1-minute imagery with the GLD-360 2-minute Lightning Density overlaid, valid from 2000 UTC to 2358 UTC on 03/31/17. Made using GEMPAK. *Preliminary, Non-Operational Data* Click here to open in a new window. The 1-minute 0.64 µm “Red” visible imagery with the 2-minute GLD-360 lightning density overlaid shows the uptick in lightning associated with the isolated supercell that moves through Chesapeake, VA and exits around Virginia Beach. Note the increased lightning intensity around the time of the tornado. Forecasters are looking forward to using the GLM data with the imagery to help better forecast thunderstorm over land and especially over the oceans. The preliminary storm surveys from the Wakefield, VA NWS Weather Forecast Office are included below for your convenience. GOES-14 has been out of storage mode and operating in Super Rapid Scan Operations for GOES-R (SRSOR) mode since August 10, providing 1-min imagery. As with past SRSOR data collection periods, the 1-min imagery is available for display in the SPC operational NAWIPS data visualization system. SPC forecasters have been utilizing the imagery in operations when available over relevant areas. Today (8/18/15) the imagery was especially valuable as GOES-15 (West) underwent a scheduled maneuver, causing a data outage between 1630 and 1759 UTC. More significant to SPC was that GOES-East, to cover for the West outage, operated in Full Disk mode, collecting images only every half hour from 1615 and 1815. This was at a time when convection began to fire ahead and along a cold front passing through an SPC slight risk area across the central US. The 1-min satellite imagery aided in 2 watch decisions during the early afternoon hours: a severe thunderstorm watch issued at 1815Z over parts of MO/IL, and a tornado watch issued at 1830Z over parts of WI/IA/IL. Cu developing in the clear sky ahead of the front in east-central MO clearly became agitated as a gravity wave feature traversed eastward through 1715Z. Over the next hour, cu quickly evolved into towering cu before eventual initiation took place. Additional development was analyzed further to the north under high clouds near the IA/IL border. Even further north in NE Iowa, strengthening of convection could be seen as bubbling/texture came through a more opaque/smooth cloud shield. Forecasters have commented that the very high temporal restitution satellite imagery allows for easier/more accurate tracking of individual cloud features/structure, especially when partially obscured by upper-level clouds. Evolution of individual features becomes disconnected with longer time between scans, making it difficult to interpret important trend information. The first animation below shows the 1-min imagery in the time period leading up to and just after initiation during which GOES-East was in Full Disk operations. The second animation shows GOES-East imagery during the same period. SPC watches appear on both. Click animations to enlarge. Fig 1: GOES-14 1-min visible satellite imagery for 1645-1859Z on 8/18/2015. Fig 2: GOES-East visible satellite imagery for 1645-1900Z on 8/18/2015. 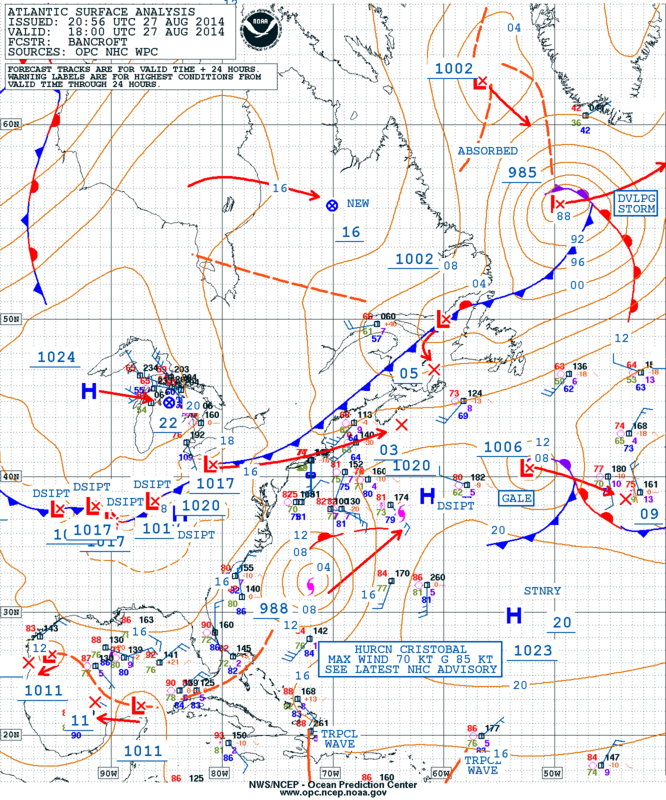 OPC West Atlantic Surface Analysis valid at 18z on 08/27/14. Another interesting feature is the lightning bursting near the center of Cristobal, especially at the very end of the animation. A strong overshooting top is observed in the visible imagery and there is a quick uptick in concentrated lightning activity associated with that cell. A possible supercell? I think it’s possible and a sign that Cristobal is still entraining some dry air into the core. What other features can you identify? GOES-14 SRSOR visible imagery with Vaisala GLD-360 2-min lightning density overlaid in 2-min increments. Animation is courtesy of James Kells (OPC). Click on the animation to expand in a separate window. It’s a shame that we will not have additional SRSOR data this year, but Mother Nature has put on quite the show and it’s incredible how we can utilize our technology in new, inventive ways to assist forecasters. As a reminder, GOES-R will launch in early 2016 and will contain a Geostationary Lightning Mapper (GLM) which will help in observing intracloud lightning as well as cloud-to-ground lightning. Another day of GOES-14 Super Rapid Scan Operations for GOES-R. . .another hurricane. Now, I know. . .Hurricane Cristobal is not a very photogenic hurricane, but during the course of the day, the storm has shown signs of better organization. One very noticeable feature has been the increase of lightning in the large, elongated band in the eastern quadrant. Over the last couple of hours, there has been a marked increase in lightning near the center of Cristobal. Could this be dry air intrusion? A sign of intensification? I’ll let you be the judge. The lightning data here is from the Vaisala GLD-360 lightning strikes, but is displayed as a 2-minute density product which was developed collaboratively among the Ocean Prediction Center (OPC), the National Environmental Satellite, Data, and Information Service (NESDIS) Center for Satellite Applications and Research (STAR), and the Cooperative Institute of Climate and Satellites (CICS) at the University of Maryland. The 2-min lightning density is time matched with the SRSOR in 2-min increments for a smooth (ish) animation. GOES-14 SRSOR (feeds courtesy of CIRA and CIMSS) with Vaisala GLD-360 2-min lightning density overlaid. Thanks to James Kells (OPC) for creating the animation. Click on image to expand in another window. Thanks for reading and feel free to share! Sunrise over Category 4 Hurricane Marie! Much of the GOES-14 super rapid scan operations for GOES-R (SRSOR) has been spectacular, but maybe I’m biased. . .this morning’s sunrise of Hurricane Marie was spectacular! I overlaid the GLD-360 lightning feed on top of the 1-minute imagery (1 to 1) and noticed some interesting observations. For one, it was evident that the eye was slowly clouding over which was unfortunate. Also. . .all of the lightning activity (what little existed) was well to the northeast, closer to land. My question here. . .does this mean there was no lightning in Marie, such as intracloud? This is where the Geostationary Lightning Mapper (GLM) will be a very useful tool in the future. It is important to note that Marie was in a rather steady-state this morning, with a possible eyewall replacement cycle on the way. . .so this may account for no lightning strikes in the eyewall.